Password software comes to the rescue when you can't remember or type your password correctly. Our password security software - Handy Password - auto fill forms and automatically fills in the login and password fields, so you have neither to remember, nor to type your passwords. Another problem is a password security. Once you've typed your password, it can be read by a keylogger and become available to a third party. You sure don't want your passwords to be compromised this way. Or do you? Because with the password software you don't have to actually type anything, no keylogger will be able to detect your password. The stronger is your password, the more secure is your information. To keep your information always secure, it is advisable to use long and complex passwords which contain not only characters, but digits as well. However, it may be hard to think of such a password and even harder to remember it, so most people will come up with a simple word like 'tree' or 'dog' thus allowing password hacking software to crack their account. 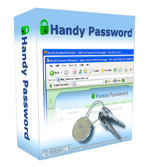 Our Password software - Handy Password - is equipped with a strong random password generator which enables you to create really strong and hack-proof passwords that nobody will be able to steal or crack. And you don't have to remember passwords! Just click the Fill button on browser toolbar and enter to your account.